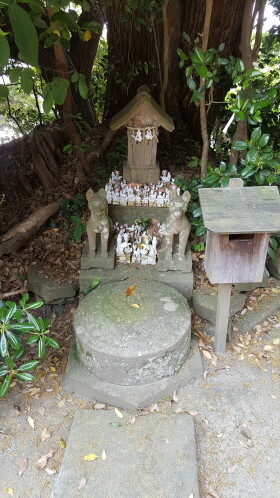 En route from the wooden castle on the hill, there is a rainbow aura round the hot sun and we stumble accidentally on the Shinto Shrine of foxes: Hearn’s favourite and so close to where he lived. It is yesterday’s epic Izumo Taisha Shinto Shrine in miniature. And full of fox cubs. 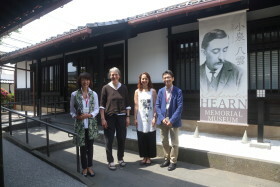 We meet at the Hearn Museum with Shoko Koizumi, museum co-ordinator and Bon Koizumi, great grandson of Yakumo Koizumi (Lafcadio Hearn – our core project interest). The museum has recently re-opened after extensive and hugely impressive refurbishment. It also features a Kwaidan section in its new exhibition space. We watch a neat and informative video about Hearn’s life, listen to ghost stories from the exhibition and discuss our ideas and plans with Shoko and Bon. We introduce them, via our gifts, to the Brontë Parsonage Museum, a place they haven’t heard of but which has so many similarities to their own literary shrine. Both museums are featuring the Irish background of their stories in the near future (regarding Hearn himself and Patrick Brontë). Links will be made. We are then permitted total access for as long as we want to Lafcadio Hearn’s old Samurai house – or the half which is left to the museum – and spend two hours photographing and sitting, absorbing the beauty of its balance between indoor and out, learning the simplicity of its lines and enjoying the comfort of its tatami mats. In the tiny pond the frogs and dragon flies eye each other. From the castle hill, ravens wheel. First, the Camelia Tea Ceremony at “old Japanese house in Kiyomizu” with Ayaka Morimoto (45 minutes). As usual we arrive only just in time, and as usual, only thanks to the endless kindness of strangers. In this case an old lady sweeping outside her home just behind the tourist chaos of the tiny streets of Ninzen-zaka, who rushes us to a shopkeeper who knows a little English. She compensates for the map. Ayaka introduces herself and takes us up to a tiny tatami and sliding walls room to demonstrate her skills with Macha tea and how to serve it. Her equal skill is with the English language which she tells us is self-taught from TV and films. But now, she says, she is going to the UK on some sort of scholarship to study business and languages for a year in Edinburgh. So she is invited to come to Yorkshire too. A real tea ceremony in Haworth in 2018 perhaps? Then: a meeting with Mami Katsuya, director of Kyoto Art Centre – no translator needed. But that also proves hard to locate. Again, we ask help in the streets and scrape into the doors of a vast converted educational building with seconds to spare. Mami shows us three large venues, many artist studios and community spaces and a glorious untouched schoolroom which I crave as our possible venue, schoolrooms being entirely appropriate for the Brontës and for Hearn. She tells us about possible funding sources – fellowships – we might apply for and offers any assistance for the future. 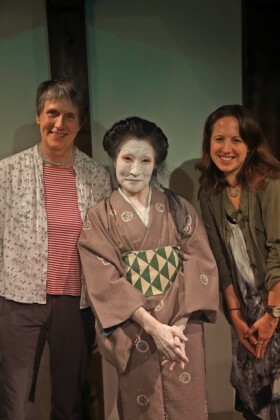 That same evening, Stacey meets with Keiko Yamaguchi performer and associate artist of Kyoto Arts Centre, then proceeds to a Butoh workshop with Ima Tenko at her studio. She (Stacey) is the first to brave the Kyoto underground. Get up early enough to walk through Imperial Gardens (where we are mobbed with delightful politeness by school children conducting foreigner surveys) to Doshisha Women’s College and our key host for the trip: Juliet Winters-Carpenter. We take lunch and discuss our project with her, and with her guests Sensei Natsumi Wakamoto, Chair of the College, and performer and director of the college Shakespeare course and production, Tim Medlock. Tim has eased in The Winter’s Tale as his current play of choice for the students, which leads to a happy discussion about the penalties of ignoring the redemptive second generational aspects of the story, as with Wuthering Heights. All are keen to assist in any way they can with links to students and professionals in Japan. We meet with Hiroko Okamoto – our translator supplied by Juliet – at Kyoto Station Main Gate, Karasuma side, and take a train to Kobe where we meet with calligrapher Misuzu Kosaka for a very long Japanese lunch in our own (business) restaurant room. She is in kimono, and looks and is as we imagined her: of another, floating world. The three-way flow through an interpreter, and the intensely exciting moments when we connect directly without, though body language, is fascinating. Hiroko does an amazingly heroic job of transmuting my intense answers to Misuzu’s intense questions and we part hoping we can share the project together in the UK as well as Japan. Misuzu has removed her ink box during the talking and makes Kanji (“things”) in a small and lovely book, which she passes on to me. I promise to send her words, via Hiroko, to make into Kanji when I begin to make the show text and seek further funding. That evening at the Kyoto Butoh-Kan we watch a performance of Hisoku by Ima Tenko. It has an intimacy and power, packed into the tiny preserved grain store venue, that we have never witnessed before. 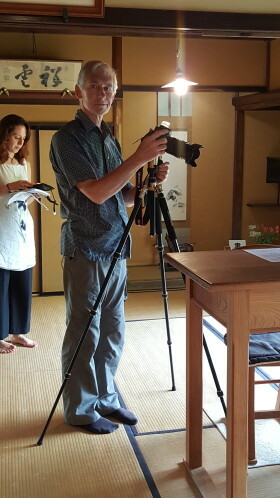 Our photographer starts to read about Butoh and its connections with landscape…. Fushimi Inari Shinto Shrine with Florentyna Leow, of Walk Japan, our mentor, adviser and now friend in Japan. 8am. “As it is late May, I think it should be less peopled than usual, and in my experience most visitors tend to only walk the first 200 metres before turning back. The view is best halfway up the hill”. Florentyna has suggested and negotiated a trek for me with her company-with-an-environmental-conscience which amounts to a financial contribution to our chosen trip extension. Lunch with Alexandra Rutter, director of Whole Hog Theatre who went to Japan on a Daiwa scholarship and seems to be staying. A mine of information about theatre possibilities and Anglo-Japanese exchanges. Stacey – Butoh workshop with Yoshito Ohno 13.00 – 15.30, with Simon spectating.